holding his sextant on the stern deck of HMS Endeavour. It’s all well and good to build a lovely ship and go sailing off toward the horizon, but how do you find your way? Roderick Eime tracks back in time to locate the earliest navigators. I’m sure my schooling was similar to yours. We were all taught about the famous Captain Cook and his marvellous voyages around the world, Christopher Columbus was mentioned and so were the likes of Captain Bligh and maybe Abel Tasman. Sure, these capable chaps were great navigators and Cook’s most valuable contribution was his superb cartography, many maps still in use hundreds of years later. But before them, how did the Egyptians, Chinese, Portuguese, Vikings and Polynesians complete their enormous voyages without falling off the edge of the world? Answer: the Moon, sun and stars. As far back as 200BC, American researcher, Rick Sanders theorised that Captain Rata and Navigator Maui set out from ancient Egypt and sailed as far as South America using a strange-looking navigational instrument called a tanawa; such an instrument was known in 1492 as a torquetum and a drawing of it can be found in caves in West Papua. Even longer ago, it is believed a Greek navigator, Pytheas, from the colony of Massalia (Marseilles) circumnavigated Britain around 350BC. An expert mathematician and astronomer of his time, Pytheas mastered the "Gnomon," an instrument described by ancient Greek historian Herodotus, borrowed from the Phoenicians, and brought to Greece about 575 B.C. When Columbus was blundering about in the Atlantic in the late 15th Century, celestial (star) navigation was still a mystery to most Europeans, but the Portuguese were slowly getting the hang of it. But Columbus groped his way across to America by the clumsy method of ‘dead reckoning’. The most impressive of the early navigators were almost certainly the Polynesians who traversed all of the central and South Pacific Ocean on their fabled migrations between Hawai’i, Aotearoa (NewZealand) and Rapa Nui (Easter Island). Studying their complex method of wayfinding (non-instrument navigation) has intrigued early European and modern researchers alike. In 1774, wealthy Chilean artist and administrator, Andia y Varela Ignacio, visited Tahiti and attempted to fathom their mysterious technique. "They have no mariner's compass, but divide the horizon into sixteen parts, taking for the cardinal points those at which the sun rises and sets. "When setting out from port the helmsman partitions the horizon, counting from E, or the point where the sun rises; he knows the direction in which his destination bears. He observes, also, whether he has the wind aft, or on one or the other beam, or on the quarter, or is close-hauled. He notes, further, whether there is a following sea, a head sea, a beam sea, or if the sea is on the bow or the quarter. He proceeds out of port with a knowledge of these [conditions], heads his vessel according to his calculation, and aided by the signs the sea and wind afford him, does his best to keep steadily on his course. 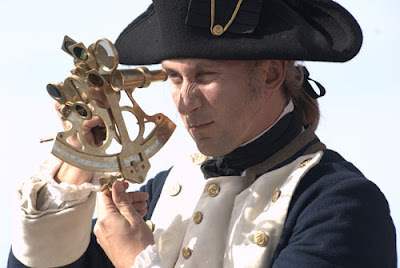 Celestial navigation has been a subject all modern sea captains must master. There have been numerous accounts of ship and aircraft crews scrambling into lifeboats after a torpedoing, ditching or other disaster and having to find their way to safety on their wits alone. In wartime, celestial navigation had the advantage of requiring no electronic equipment that might give telltale signals or be jammed by the enemy. Nowadays, of course, increasingly cheap satellite-based GPS navigational devices are available for motorists and bushwalkers to guide them through every step of their journey, whether it be to Mount Kosciusko or Woolworths. A sextant uses two mirrors. One of the mirrors is half-silvered, allowing some light to pass through. In navigating, you look at the horizon through this mirror. To find latitude, first measure the angle between the horizon and the sun when the sun is at its highest point at noon by your watch or chronometer. Refer to your tables to tell you which line of latitude the sun is above on that particular day. eg, at noon on December 21, and the sun is directly overhead. On that day the sun is above the Tropic of Capricorn, so your latitude is 23.5 degrees S.